This weekend, Protestants commemorate Luther’s posting of the 95 Theses on the Wittenberg church door, a call to disputation that marks the symbolic starting point for the Reformation. 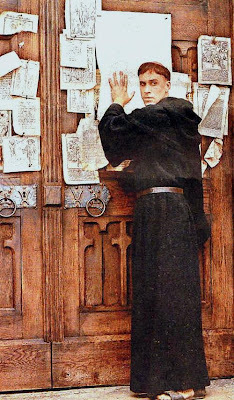 As Luther slashed through the corruptions of late medieval Catholicism, “priesthood of all believers” rapidly became one of the great slogans of the Reformation. Every Christian is a cleric, Luther proclaimed in one of his earliest treatises, The Freedom of a Christian, and those who “are now boastfully called popes, bishops, and lords” are in reality “ministers, servants, and stewards, who are to serve the rest in the ministry of the word”—servants of the servants of God. Whether he knew it or not, Luther was ringing the changes on a patristic teaching that had never wholly been lost during the medieval period. Unfortunately, the priesthood of the faithful in both its Protestant and Catholic forms has been corroded by fusion with modern individualism. While no denomination sanctions this fusion, strains in popular Protestantism, especially American Protestantism, have taken “priesthood of believers” to mean that every believer has an absolute right of private judgment about morals and doctrine, the liberty to interpret the Bible with complete autonomy. “Priesthood of believers” means that believers can do very well without attachment to any church, thank you very much. Each believer is a church unto himself. Renouncing Rome’s one Pope, Protestantism has created thousands.